Bark in the Ballpark A Success! (Fort Mill, SC) - It was a beautiful day for baseball on Sunday, June 2 as the Charlotte Knights welcomed all fans and dogs out to Knights Stadium for a 2:15 p.m. matinee game between the Knights and Rochester Red Wings (Triple-A affiliate of the Minnesota Twins). The team's annual Bark in the Ballpark celebration was filled with dog-themed tables on the concourse, a pre-game on-field dog parade, pooch-friendly music, and more. The great people from the Human Society of York County were on-hand for the event and the goal of the day was to raise money and find a good home for some of their puppies. All of the dogs in attendance strutted their stuff during the parade and later in the day. Dogs of all ages and sizes were in attendance on Sunday. Fans had a chance to see some dog clips on the in-stadium videoboard. One of the mound visits featured a clip from the Jetsons' Astro. Other video dogs were Scooby Doo, Snoopy, and Brian from Family Guy. 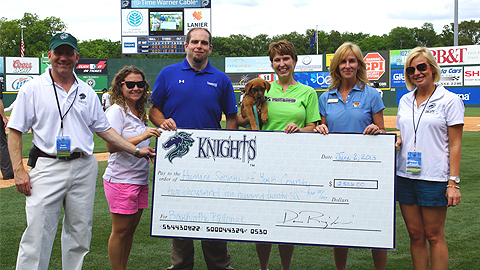 Later in the day, the Knights had a special check presentation on the field to announce that the team raised $2,526 for the Human Society of York County. The money raised will go to insuring that all of the dogs at the shelter are well taken care of before they are adopted. In all, three of the five dogs were adopted on Sunday at Knights Stadium and will now go to a great new home. The entire Bark in the Ballpark celebration was sponsored by Nutramax Laboratories and Spay Neuter Clinic of the Carolinas. Sunday's game gave true meaning to "Dog Days of Summer". It was a barking good time! Tickets for all games this season are on sale now and can be purchased in person at Knights Stadium, by phone at 704-357-8071 ext. 2106, or online at http://www.charlotteknights.com.